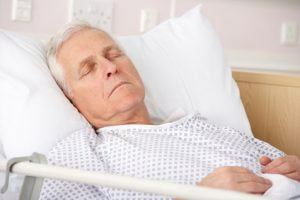 Pressure sores, also known as decubitus ulcers, bedsores, and pressure ulcers are a clear sign that neglect may be a serious problem in a nursing home or indicate medical malpractice in a hospital. The reason behind it is that these pressure sores develop when there is unrelieved, constant pressure on the skin. This may cause life-threatening injuries such as infection. These pressure sores develop in the areas of the body where the skin and bone are within close contact of one another. This includes our heels, ankles, elbows, back, and hips. While many nursing home residents are sedentary for a prolonged period of time, there is no excuse for the development of pressure sores. Studies have shown that changing positions frequently (every two hours in bed, every 15 minutes in a wheelchair) is the best way to prevent the development of pressure sores. It is important to avoid resting on the hipbones, because the skin and bone are in extremely close contact with one another. This is where it is important to have dedicated staff members that have the time to visit every patient and turn him or her throughout the day. Clinical trials have shown that the development of these painful sores is preventable, provided staff members make sure that the patient is turned. When the patient is unable to move him or herself, it is important that staff members be vigilant. What are the associated complications? Cellulitis – This inflammation of connective tissues is able to infect people who have pressure sores. Having cellulitis may lead to the development of meningitis. This disease affects the fluid that surrounds our brain and spinal cord. Sepsis – This is a bacterial infection in body tissues or the bloodstream. The open pressure sores allow the bacteria to enter into the patient’s bloodstream rather easily. Once the bacteria have gained access to the bloodstream, it can spread throughout the body quickly. This may lead to organ failure and other life-threatening medical problems. Cancer – if the patient suffers from chronic pressure sores, it may lead to the development of squamous cell carcinoma. This is a type of cancer that will almost always require the patient to undergo surgery. Once these pressure sores have developed, it may be challenging to treat them. If the patient suffers from Stage I pressure sores, physicians will use a combination of cleaning solutions and antibiotics. However, at later stages, surgery may be necessary to relieve the pain and infection brought on because of the pressure sores. Keep in mind that understaffing or stress on the job is never an excuse for your loved ones developing pressure sores. If you feel someone you care about is suffering because of neglect, it is important to speak out and seeking legal counsel as quickly as possible. Especially when we consider how easy it is to stop the development of pressure sores and how painful the results are, it is important to always make your concerns know.